Before you can add a tenant, you must set the property's asset type to Managed. For more information, click here. 3. 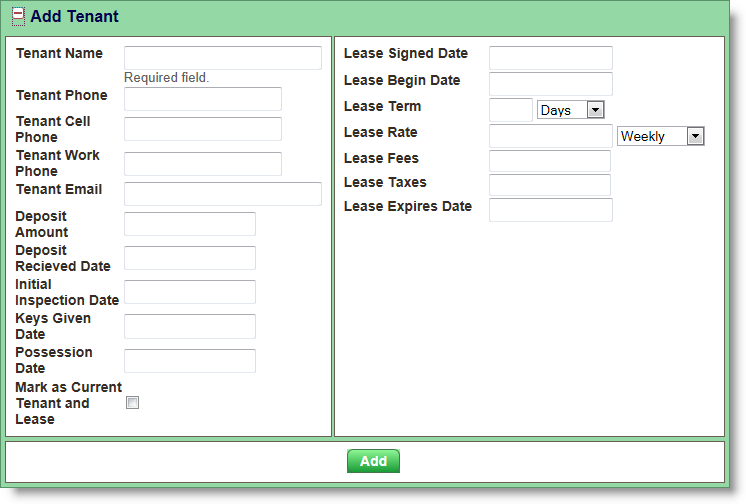 Enter in the available tenant and lease information. 4. If you are ready to establish this individual as the current tenant on the property, enable the Mark as Current Tenant and Lease check box. This will activate this tenant and all lease information, and will remove the no current tenant alert at the top of the screen. If you have input the tenant and/or lease information but are not ready to remove the no current tenant alert, leave this box unchecked. For information on marking the tenant current at a later time, click here. 5. When all information has been added, click the green Add button.